PHNOM PENH (20 Feb 2019) – It was a battling performance from two close rivals but in the end, Malaysia and Indonesia had to be content with the one point each following their 2-2 draw in their second game of Group B of the AFF Under-22 LG Cup 2019 here at the National Olympic Stadium here in Phnom Penh, Cambodia. While Malaysia won their first point after losing to the hosts two days earlier, for Indonesia it was their second point of the competition as they look to wrap up the group with a match against Cambodia on Friday. The fight was almost even in the first half although it was Indonesia who came the closest on several occasions. Gian Zola Nugraha, Rachmatrianto, Muhammad Rafi Syarahil and also Osvaldo Haay all had their chances but either it was too wide or they were denied by the hardworking Malaysian captain Dominic Tan who formed a strong defence alongside Ariff Ariffin. 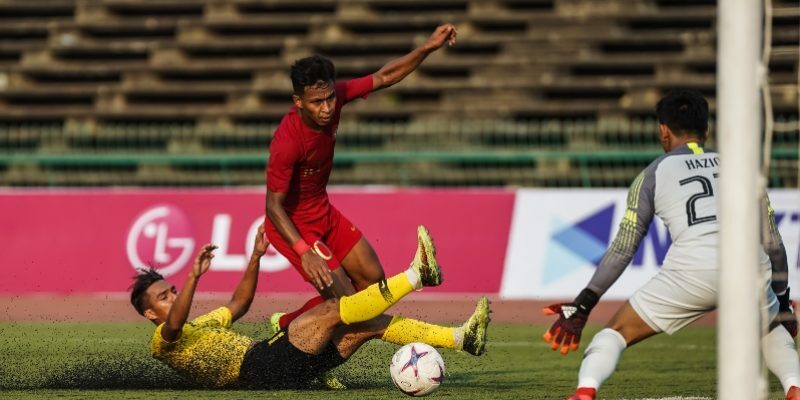 Malaysia continued to struggle after the break and just eight minutes after the restart, they finally fell behind when Marinus Wanewar punished a defensive lapse. But the Malaysians stayed their course and in the 62nd minute they drew level with the wily Nik Akif Syahiran Nik Mat delivering a well-taken freekick. Indonesia continued to pour forward from either flanks and in the 77th minute, Witan Sulaeman fired in from some 20 metre out to beat Muhammad Haziq for the second time. And just when Indonesia thought that they had the three points in the bag, a corner from Nik Akif three minutes to the end, was headed into goal by the lanky Muhammad Hadi Fayyadh Abdul Razak.